Winter is not always just cozy sweaters, fireplace evenings and Christmas songs. For our skin, the harsh winter cold and the dry indoor air can be quite damaging. Keeping your skin glowing in the winter can be a challenging task, but it’s something that must be done in order to prevent dry, cracked, and painful skin. So, instead of hiding your face under a winter hat or an oversized scarf, let us give you 7 ways you can keep your skin glowing this winter! In the summer months, we have a higher level of humidity which is responsible for the dewy and fresh look we all love. However, as the temperatures go down, so does the moisture in the air. This means that in the cold months of winter our skin will lose moisture and it will become more and more difficult to avoid dry skin. And to make matters worse, coming back home from a cold day out and sipping wine in front of a fireplace is also an additional shock for your skin. Heating that we use to warm up also dries out the air around us, which in turn makes your skin problems even worse. So, how can you keep your skin glowing this winter despite of the harsh conditions? We all know the blessings of a good moisturizer. Well, in winter, multiply this importance by a hundred! Having a good moisturizer that suits your skin is the best way to lock moisture in. However, you should know that what worked for your skin in the summer might not do the same in winter. In the colder months, your moisturizer needs to be heavier and if possible – oil-based. Water-based moisturizers are too light and they get absorbed too quickly in your skin. On the other hand, oil-based moisturizers will be greasier and stay on for longer. This is exactly what you need when you’re out in the cold and dry air. Remember that your winter moisturizer has to act as a barrier between your skin and the outside air. It’s always good to invest in a natural moisturizer that is enriched and infused with ingredients such as Vitamin E or other healthy oils. And finally, make sure that the moisturizer you choose is also a sunscreen and contains at least SPF30. Many people forget that winter sun-rays can be just as risky as summer sun. Using hot water for showers or face washing can be especially tempting in winter when all we want to do is to warm up. However, hot water can strip your skin’s natural produced oils. 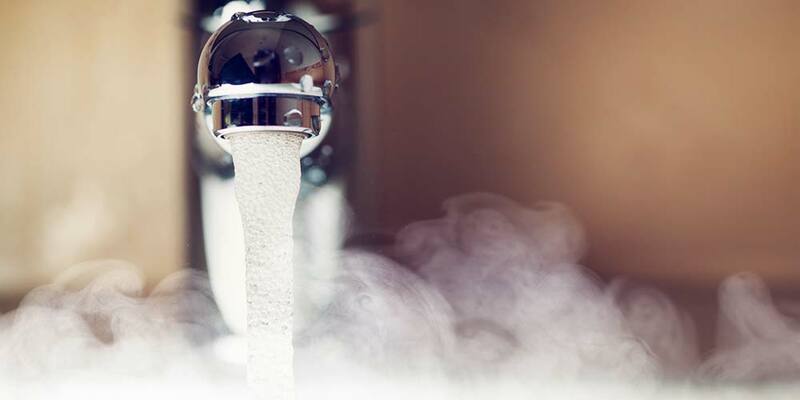 So, no matter how tempting it might be to jump into that hot shower and fill your bathroom with steam, using lukewarm water is much better in winter. What’s more, try to shorten your shower time. Another additional trick you can try is moisturizing right after your shower. This is when all your pores will be open and able to absorb the moisturizer much better! And don’t be afraid to use moisturizer generously! Winter is usually a time when we all like to enjoy hot cocoa cups, so many times we forget to hydrate and drink pure water. As we all know, hydrated skin is healthy and glowing. And hydration isn’t only achieved from the outside but also the inside. Always make sure that you carry a water bottle with you. Additionally, place water bedside table. This way, you’ll have no excuse for not drinking enough water. Another great thing to do to warm up from the inside out is to prepare yourself a cup of warm water with lemon in the mornings. This is a refreshing drink that will wake you up better than a cup of coffee. Plus, you’ll know that you’ve started your day in the healthiest way possible! Last but not least, avoid dehydrating drinks and foods such as sodas, alcohol, salt, etc. In the cold winter months, it’s not only your facial skin that suffers but also any other exposed body parts such as your hands. The back of the hands is an especially problematic area in winter, since it can get very dry and cold and start cracking and becoming painful. One way to protect your hands and face is to moisturize regularly. Another way you can help your skin in these areas is by wearing gloves to protect your hands and scarves to protect your neck and face. Choose warm materials that lock moisture in instead of lightweight and thin. This will make an incredible difference, especially for the skin on your hands. The same way in which water hydrates your body from the inside out, so does the food you eat. Eating healthy fats and oils such as avocado, salmon, nuts and seeds, is always a good nutrition plan – especially in those brutal winter months. The healthy fats in these foods are important for skin regeneration and skin health in general. You will notice a huge difference in your complexion in just a few days – your skin will start glowing, your complexion will be even, everything will just be less dry and more hydrated! Aside from improving your skin health and appearance, products high in healthy fats will also curb your hunger and help you drop some winter pounds – what more can we ask! If you’re not sure whether or not you’re eating enough healthy fats, add an Omega 3 supplement to your diet. Exfoliating your skin properly and with the right product is an important step in every winter skincare routine. And no, exfoliating your skin in winter will not make it even drier! Your creams, lotions, and moisturizers won’t be able to penetrate and absorb into your skin if you have a barrier of dead skin cells on top. Some of the best exfoliating products for winter are the ones that are gentle for your skin and contain hydrating ingredients such as coconut oil, beeswax, etc. This will make your skin smoother than ever before! Aside from getting enough beauty sleep, nights are an amazing way to wake up feeling and looking better. For example, try using a nourishing overnight mask and wake up with a smooth and flawless face. Or, use nourishing face oils or serums which have powerful skin hydration properties. Another trick you can incorporate is using nighttime for hydrating some of the driest areas of your body such as your elbows, feet, and knees. You can do this either by applying a heavy moisturizing cream or a natural product such as Shea or Cocoa butter. Then, put on some loose socks that can keep the moisture in. When you wake up, all that moisture will be absorbed and these areas of your body will no longer be dry. Adopting this routine 1 or 2 times per week is enough to get glowy, and regain your skin beauty. If you wish to take this overnight beauty routine one step further, you can try using an air humidifier in your bedroom. This is an amazing way to fight the air dryness caused by your heating system. As I’m sure you’ve experienced, winter weather can be cruel on our skin. The cold winds together with the dry heat indoors are a perfect combination for skin damage and dryness. Not only that dry skin doesn’t look attractive at all, but it can actually end up causing more serious skin damage such as redness, itching, chapped lips, pain, cracking, and even bleeding in extreme cases. This is why we’ve decided to put together a list of 7 ways you can keep your skin glowing this winter. To shortly sum up, your winter skin beauty products have to be different and heavier than your normal products. This is especially true when it comes to moisturizers, so investing in a good and nourishing moisturizer can be a lifesaver! Next, make sure that you’re not using hot water for your showers and you limit your bath time to just a couple of minutes. Another thing that you have to do to achieve a glowing skin is to eat healthy fats and drink plenty of water. Furthermore, make sure that you exfoliate your skin regularly so that you remove the dead skin cells on top and expose the smooth and beautiful layer underneath. And finally, don’t forget to check if your moisturizer contains SPF, since winter sun can be even worse than summer sun! All in all, achieving a healthy and glowing skin in winter is definitely possible. By following the tips we gave you above, you’ll manage to look fresh, dewy, and glowing every single day, and your skin will look amazing all year long! Previous articleHow To Care Your Skin?